Remove the engine sprocket cover. 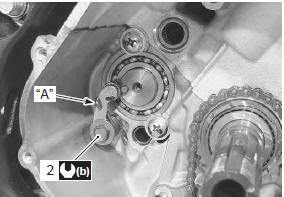 Refer to “engine sprocket removal and installation” in section 3a . Remove the clutch components. Refer to “clutch removal” in section 5c . 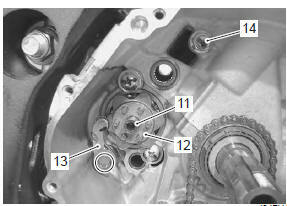 Remove the snap ring (1) and washer (2) from the gearshift shaft. Remove the gearshift shaft assembly (3). 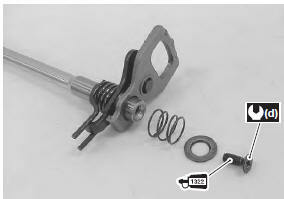 Remove the following parts from the gearshift shaft. Remove the gearshift cam plate bolt (11) and gearshift cam plate (12). 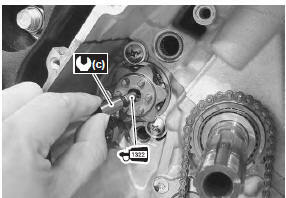 Remove the gearshift cam stopper (13). Remove the gearshift arm stopper (14). the removed snap rings must be replaced with new ones. Apply a small quantity of thread lock to the gearshift arm stopper and tighten it to the specified torque. 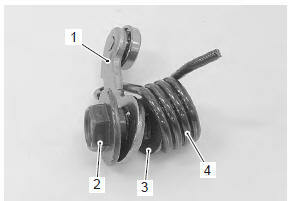 Assemble the gearshift cam stopper (1), bolt (2), washer (3) and return spring (4). 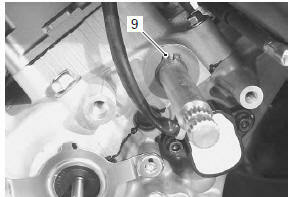 Tighten the gearshift cam stopper bolt (2) to the specified torque. hook the return spring end “a” to the stopper. Check the gearshift cam stopper moves smoothly. Locate the gearshift cam in the neutral position. Install the gearshift cam plate (5). 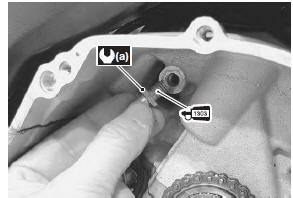 align the gearshift cam pin “b” with the gearshift cam plate hole “c”. 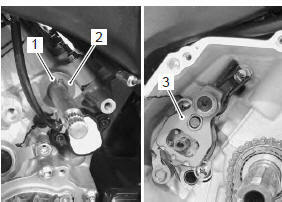 Apply a small quantity of thread lock to the gearshift cam plate bolt and tighten it to the specified torque. 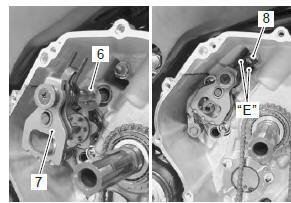 Apply a small quantity of thread lock to the gearshift shaft end screw and tighten it to the specified torque. When installing the gearshift shaft return spring, position the stopper “d” of gearshift arm between the shaft return spring ends “e”. 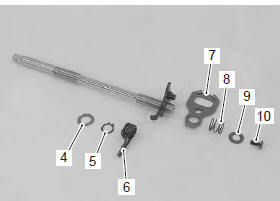 Install the washer (6) and gearshift shaft assembly (7). 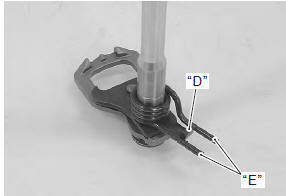 pinch the gearshift arm stopper (8) with return spring ends “e”. 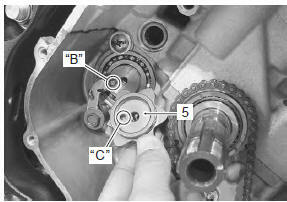 Install a new snap ring (9). After installing the gearshift lever, check the gearshift lever height. Refer to “gearshift lever height inspection and adjustment” .